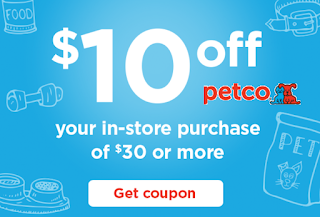 Petco Coupon, $10 off $30 Purchase in-store. Valid through 12/29 in-store only. Save $10 on your pet food purchase the next 2 days! Must have a Free Petco rewards account to redeem. If you don't have an account yet then CLICK HERE to make one. When at the store you can enter your phone number at checkout to verify you have an account.